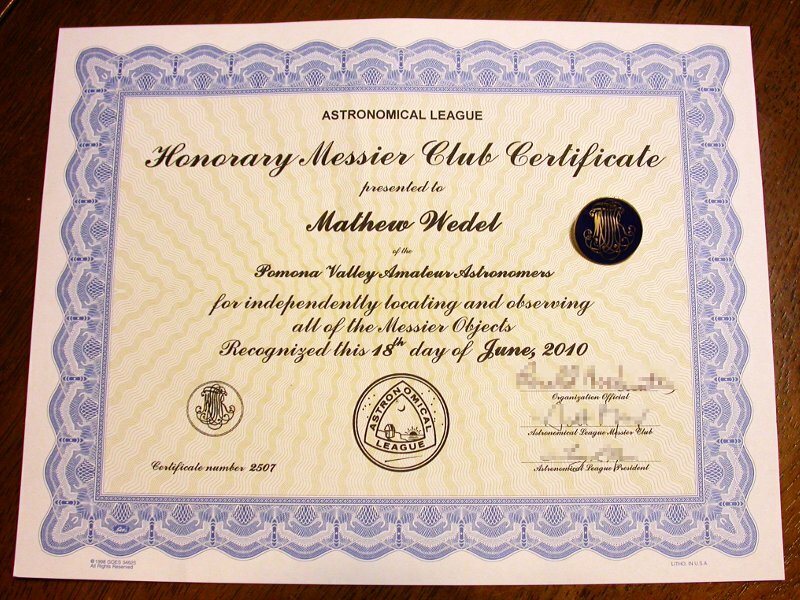 Back in May I logged my final Messier object, thus completing the requirements for the Hononary Messier certificate from the Astronomical League (you can get the regular Messier certificate for observing 70 of 110 Messier objects). Although you can submit your observations to the AL yourself, it is recommended to have the AL representative of your club look at your logbook and send a letter to the AL to the effect that your observations are satisfactory. The PVAA doesn’t have a regular AL liaison but the then president, Ron Hoekwater, was willing to vet my logbook. He also suggested that I hang on to the certificate so that he could present it to me at the next meeting. The problem was, I didn’t attend the next meeting, because in June I was crazy busy with teaching. And I didn’t attend the meeting after that, because in July I was in Uruguay. So tonight’s meeting was the first that I’d attended in three months. 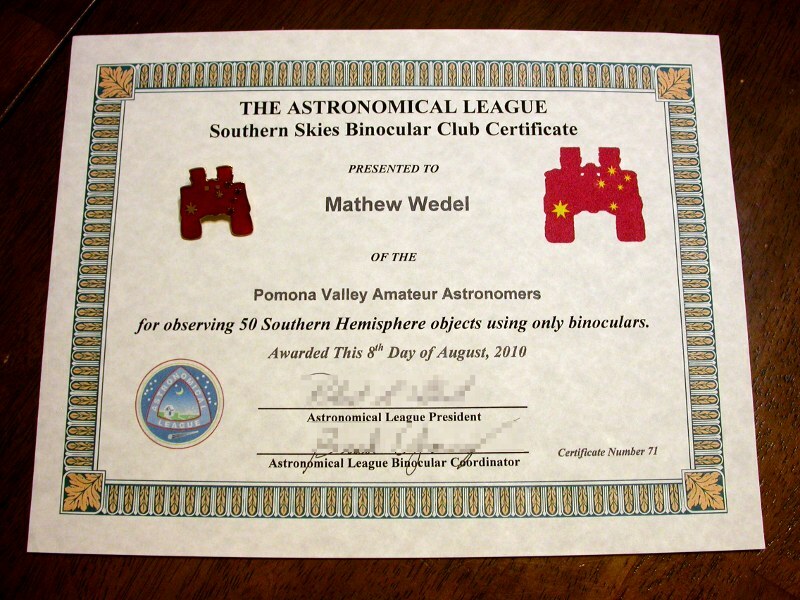 …and the Southern Sky Telescopic Club. And when I got back, I logged the final object for the Deep Sky Binocular Club, which I’d been working on since January. 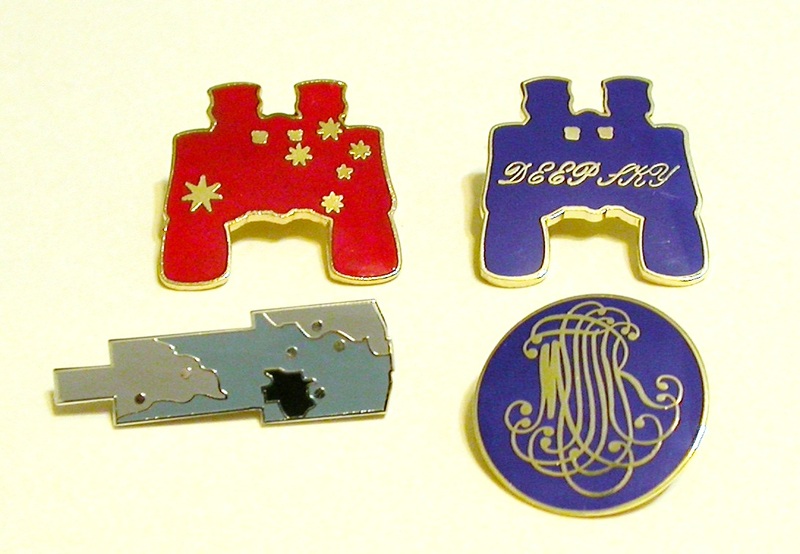 So the certificates and pins have been slowly piling up. 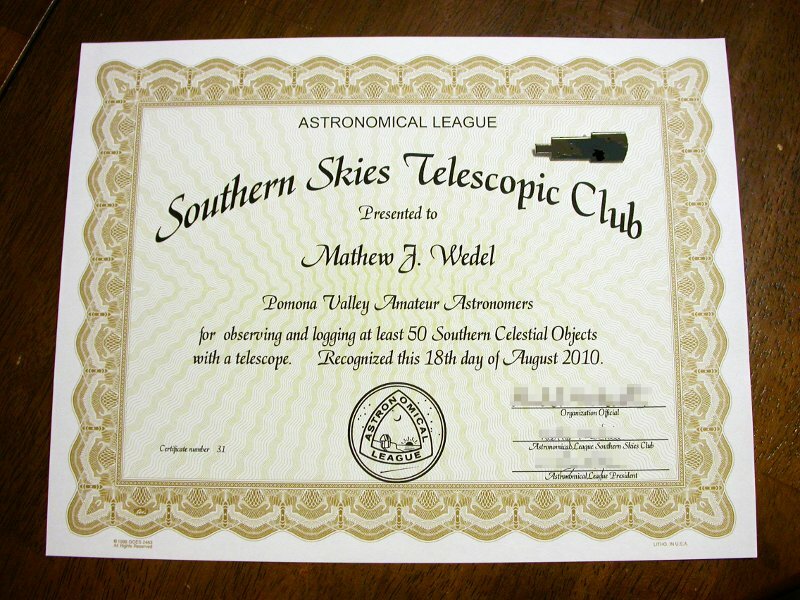 In fact, the bling for the Southern Sky Telescopic club arrived in the mail just this afternoon. At tonight’s meeting Ron presented all four to me, and asked me to say a few words to the members about the AL observing clubs and about observing the southern skies from Uruguay. In other PVAA-related horn-tooting, after missing the month of July my series counting down the world’s largest telescopes resumed in this month’s Nightwatch. This link should be good for the next three months, after which it will be available at the archive site. Last night I actually got out for an hour and bagged three targets for the Urban Club, so that club has 66 down and either 34 or 44 to go. Anyway, it was an enjoyable hour of stargazing. 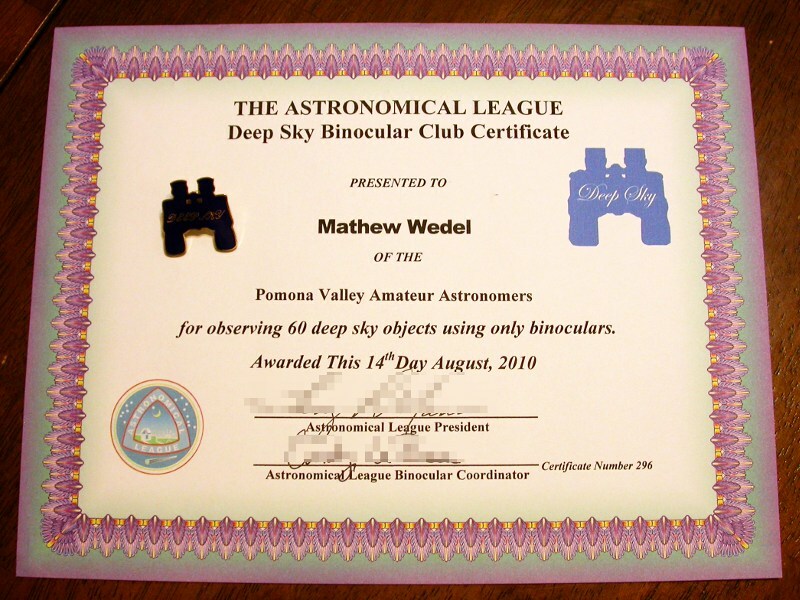 More bling in the mail today: my certificate and pin for the AL Binocular Messier Club. The pin is already on my Kepler cap, which is now triply geeky (once for this pin, once for the Lunar Club pin, and, let’s face it, once for being a ballcap that celebrates a space probe). If you are a member of the Astronomical League–and if you’re a member of a US astronomy club, AL membership is probably included with your local club membership–this is a no-brainer. 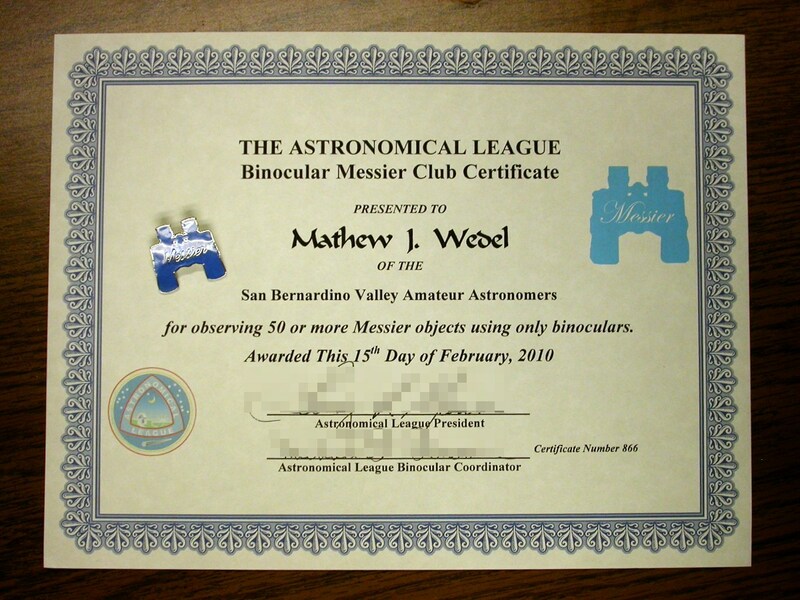 You only have to see 50 Messiers with binoculars to complete the Binocular Messier Club requirements and score your own bling. I’ve gotten 99 Messiers with binoculars so far, not because I have to, but because it’s fun. And because the more I see with modest instruments, the less I feel like a wuss next to Jay Reynolds Freeman. But mostly because it’s fun. After looking at small patches of sky at medium or high magnifications, it’s nice to sweep large swathes of the sky at low magnification. I’ve learned more about the forms of celestial objects at the telescope–but I’ve learned more of my way around the sky with binoculars. It’s the perfect project for a beginning stargazer, whether you’re in the Astro League or not. Give it a shot! 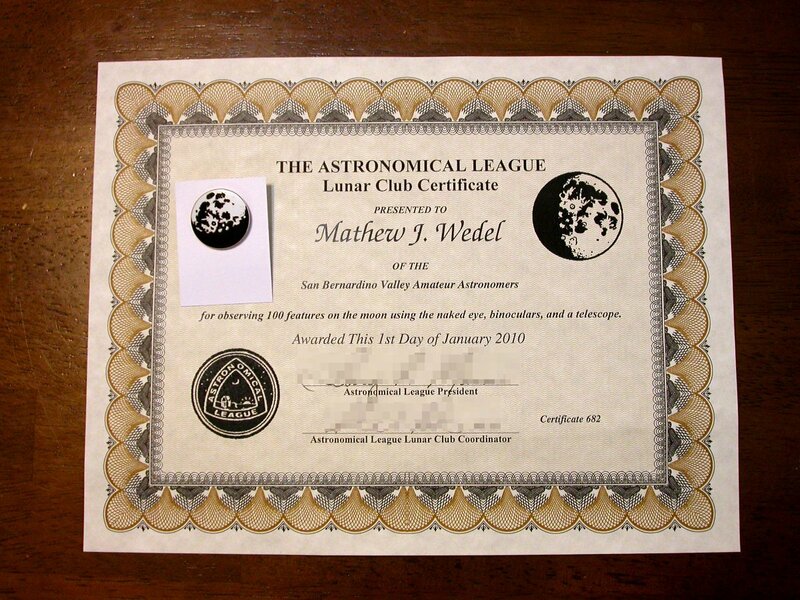 As I related in an earlier post, on Thursday, Dec. 17, I made my final observation for the Astronomical League’s Lunar Club. I e-mailed in my completed observation log a couple of days later. Yesterday my loot came in the mail: a certificate and pin. I felt a sense of accomplishment (and, in the spirit of full disclosure, relief) on the evening that I made my final observation, and it was nice to send off my log, but there’s something extra special about getting the official certificate and pin. You know why they give these things out? I think it’s for the same reason that judges wear black robes and baseball fans doff their caps for the national anthem. We are a symbolic species, and on some subconscious level that stuff works, whether we want it to or not. The certificate is going on the wall over my astronomy bookshelf, and the pin is going on the Kepler mission cap I got at the JPL gift shop last week (I still need to blog about the JPL tour–so much to do!). There are many like them…but these are mine! And I want more. I’ve been plugging away at the target lists for the Messier Club and Galileo Club, and tonight is the start of a new lunar cycle so in a couple of nights I can get back to my observations for the Lunar II club. Good luck with your own observations. If you’re not doing a formal observing program, give it some thought, working through one is challenging, rewarding, and fun. The complete list of AL observing clubs is here, and there are lots of other observing programs out there in books, magazines, and on the web. You are currently browsing the archives for the Bling category.